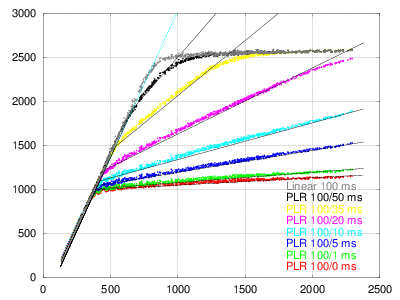 Some attempts to reverse engineer the PLR high dynamic range mode from CMV12000. 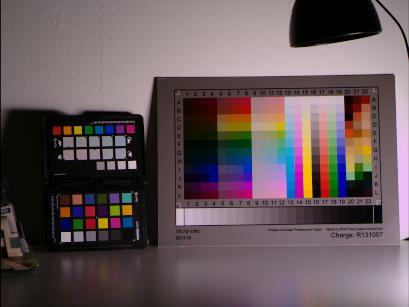 I'll use an IT8 chart, exposed at 30 ms (normal exposure) and 100 ms (overexposed). A little dark in the lab today, but shouldn't be a big problem. To analyze the images, I'll use octave 4.0, compiled with 16-bit image support. The scripts should run in Matlab as well, with minimal changes. Let's check if the first image is really exposed to the right, in octave. 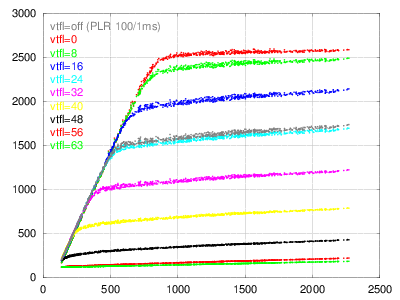 Let's start with a 2-segment PLR exposure, 100ms/10ms, vtfl2=32. 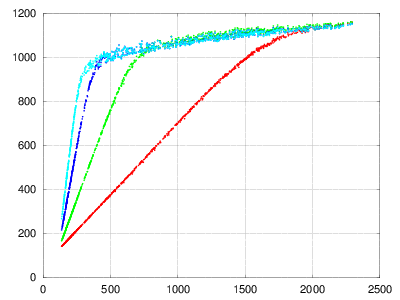 That means, Number_slopes = 2, Exp_time = 8072, Exp_kp1 = 805, Vtfl=96. Let's leave Vtfl constant and change exposure time for the second segment (0,1,5,10,20,35,50 ms). there is a noticeable light leak in the second segment, but it doesn't seem to change with base exposure time. As expected, these settings do not seem to have any noticeable effect when num_slopes = 2. Let's go back to the scenario with constant Vtfl and variable exposure. Notice the knee point appears to move to the right with higher Exp_kp1 values. Why would this happen? % which pixels reach vtfl? Let's see how it compares to our real data. Notice the slopes of the second segment seem to be higher in the real data, compared to our model, as if the real exposure time would be a little higher. 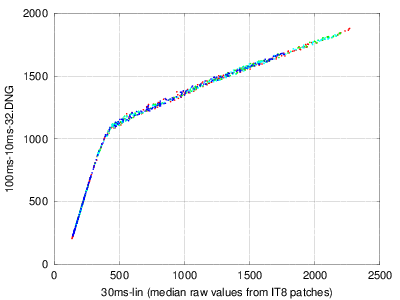 Since the slope at exp_kp1=0 doesn't depend on total exposure time, let's assume there is some sort of exposure leak - that is, the actual exposure time is exp_kp1 + some constant (called exp_leak). 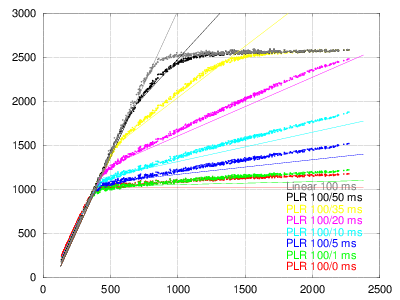 Tuning parameters (trial and error): vtfl_thr = 850, exp_leak = 2.5ms. Black level 128 (after subtracting black reference columns, dark frame and dark current nonuniformity). 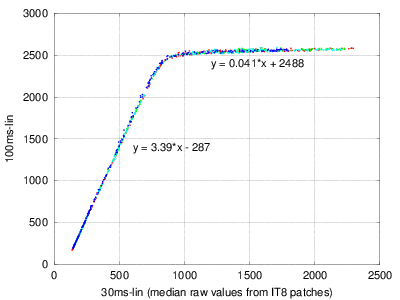 Reference frames obtained from fitting 256 dark frames taken at exposures from 1 to 64 ms, in 1 ms increments, 4 images at each exposure, with raw2dng --swap-lines --calc-dcnuframe *x1*.raw12. This model appears to explain the actual response curves pretty well, but there's still room for improvement. 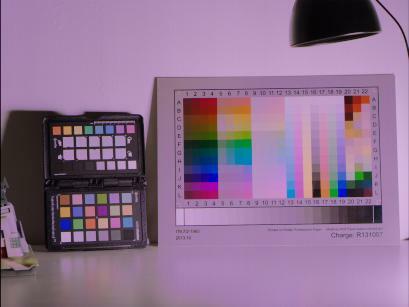 'At this point, I would try to find some real response curves and reduce the noise of the test images by averaging multiple frames, then repeat the experiment. This will take a while. After averaging 50 frames at each setting, the noise in the curve remained the same, so it must be systematic error (correctable with some sort of calibration frame). Finding response curves from bracketed images is difficult - we can't just scale exposure times hoping we'll get the same curve. We will need a dimmable light source with no ambient light (or some dedicated calibration hardware). This page was last edited on 26 June 2018, at 16:01.